Houston, Texas would seem like a strange place to find one of the swankest new exotica/space-age pop groups out there, but that’s where the talented tiki outfit Clouseaux hails from. 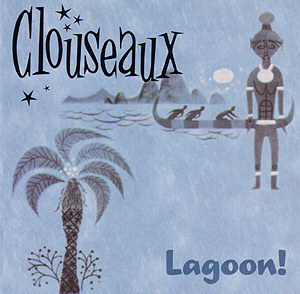 Clouseaux prove in their latest release Lagoon! that exotica is strictly a state of mind. What they’ve done is pour equal parts Martin Denny, Les Baxter, Arthur Lyman, Henry Mancini, Combustible Edison, and Don Tiki into a bar blender and hit puree. Then they added a splash of surf guitar, tossed in a couple of cubes of prog rock, garnished with an umbrella, and served in all up in the coolest tiki mug they could find. Clouseaux’s music is filled with that wonderful mix of hi-fi happiness and savage jungle sophistication. It’s epic and playful all in the same breath. There’s a frantic energy that pulsates from every track. Their jungle is one of exotic beauty and sizzling sensuality…but is also a place of hidden danger and mystery behind every palm tree. Picture a Moai head surrounded by dancing island girls all singing for you during the climax of a torch-lit ritual while headhunters hide in the background. The album really comes alive on the tracks “The Kiss of Ku,” “Krakatoa,” and “Noctopia.” Earlier versions of some songs like the afore-mentioned “Krakatoa,” “Reum with a View,” and “A Most Excellent Flying Death” appeared on Clouseaux’s self-titled debut. However, their Lagoon! versions seem more fleshed-out and developed. There has also been a stylistic shift between that first album and the current one—an evolution between the space-age side of things to the exotica one. This happened during their E.P. Destination: Oasis. (The E.P. features a lot of the Lagoon! material and is well worth searching out.) With Lagoon!, Clouseaux have truly found their tiki spirit—their Aku-Aku if you will—and we are all the better for it. You can find out more about Clouseaux at their website: www.clouseaux.com. You can also hear Clouseaux often on the Bachelor Pad Radio Show.